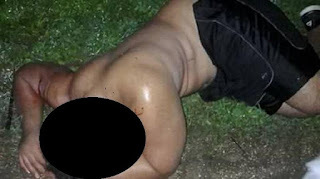 Disturbing photos posted online show a man lying on the ground with blood on his body after he was allegedly beaten by locals of Lakepa, Tongatapu. Kaniva News reports pictures have been shared on Facebook by users who claim the photos were taken while the man was attacked. It was alleged the man was beaten after he was captured at the Mormon Church complex in Lakepa with properties belonging to the church. The attack on the suspect was made while the locals were waiting to Police, the reports said. The man has history of psychiatric hospitalization, Police said.